Today is the first day of a series where we’re going to look at every player that will be in Major League camp with the Cincinnati Reds. There will be some background information, profiling, projections, and more between now and the end of the spring. We are going to start out by working our way through the non-roster invitees before getting to the players on the 40-man roster who may be a bit more familiar to everyone. To see all of the posts in this series, you can click here. Acquired: Drafted by Cincinnati, 2nd round, 2015. Height/Weight: 6′ 3″ / 240 lbs. Tony Santillan is one of the Cincinnati Reds top prospects. The right-handed pitcher is the 4th ranked prospect in the farm system, and the 2nd ranked pitcher. He’s worked his way up through the farm system, making stops at every level along the way through Double-A where he topped out in the 2018 season. As mentioned above, in 2018 Tony Santillan topped out in Double-A. That’s not where his season began, though. His season began in Advanced-A Daytona where he had a 2.70 ERA in 86.2 innings with 22 walks and 73 strikeouts. In the second half he was promoted to Double-A Pensacola where he threw another 62.1 innings over 11 starts. His ERA was 3.61 with 16 walks and 61 strikeouts in that span. Prior to the 2018 season the big rub against the young right-handed starter was that his control wasn’t good enough, or consistent enough. When he was drafted out of high school he had a big-time arm, but control was a big concern. Prior to 2018 he had thrown 217.0 innings in his professional career and had walked 107 batters. He had always racked up good strikeout numbers, but the control issues, while improving over the years, were still concerning. It was the 2018 season that saw him take a step forward where he found consistency in the control department, along with just overall improvement in the area. There’s not much of a chance that Tony Santillan breaks spring training with the Cincinnati Reds. He’s only made 11 starts above A-ball in his career. While his pure stuff doesn’t lack behind almost anyone in the entire organization, he won’t be 22-years-old until nearly three weeks into the regular season. With a seemingly set rotation, and some depth behind those guys, there’s no need to rush him. How could Tony Santillan fit in Cincinnati in 2019? As noted above, seeing Tony Santillan in the early part of 2019 doesn’t seem likely. But as the season goes along and he continues to pitch in the minors, if a spot opens up in the rotation he could slide into the rotation if he’s pitching well. It would be unlikely to see him come up in a bullpen role, unless it were at the end of the season and the Reds were in contention. In that scenario, as we’ve seen with others around baseball, a big-time arm coming up late as a potential weapon for a playoff run could be an option. I don’t ever like using the term at the earliest (though I’m positive I have) for guys who have already played in Double-A. At that point, especially for a starting pitcher, they could get the call whenever, especially if they are pitching well and a spot opens up. Luis Castillo jumped right up from Double-A after less than half of a season. Now, the situation was a tad different as the rotation wasn’t in the same shape as it *seems* to be today. But, Castillo and Santillan are kind of the same breed: Big time stuff guys. When those guys seem ready, call them up. I think this dude may end up being the best prospect in the whole system other than Senzel. He has stayed healthy too. I think trammel is a sel high candidate especially with Siri emerging. 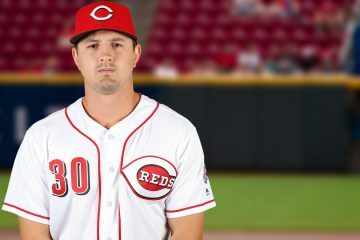 Regardless, Santillan doesn’t get enough love and I think a reds rotation anchored by Castillo-Santillan and Gray in a couple years could be really good. All one of those guys could be front end of rotation guys at their potential, not unreasonable to think one will. I haven’t checked this to be honest but I would be very surprised if Hamilton ever showed the kind of power in the minors that Siri has. That power that Siri will bring to the table will bring alot more patience with the strikeouts for Siri than there ever was for Hamilton. But I hope he keeps growing and can become a true double threat much like Eric Davis back in the day. That was one year not two, and he was coming off the broken thumb. Hes absolutely raked in the dominican this winter, same way he did at Dayton when he was the best hitter in the entire Midwest league. He might be a hot/cold guy, but completely different type of prospect than Billy. I am well aware that it was one year. His entire minor league carreer is a .316 OBP, .471 SLG. Compare that to Trammell and Senzel and you will see significantly different numbers. Hitting in the Dominican league is good to see, but that is not the majors. “Grade C prospects are the most common type. These are guys who have something positive going for them, but who may have a question mark or three, or who are just too far away from the majors to get an accurate feel for. You are underselling Jose Siri. Somewhat. There’s risk there, no doubt. But he’s more than a “Grade C” prospect. He’s an elite defender with power at a premium position. He needs a .300 OBP to be an above-average player in the Major Leagues because the power/speed/defense is going to be very valuable. Siri is a A/D prospect, with no real space in between. A true Boom/Bust player (bust far more likely, but stranger things have happened). He either cuts the K rate and is an all star caliber player, or he is a 4/5 OF who is used as a pinch runner/defensive replacement who K’s too much. Doug, the most recent gradings I have seen list him as C+, so no I am not underselling him. I am simply repeating what has been state by the people who evaluate these type of things. He was previously graded as B- after his performance in Dayton then dropped after last year. He is not even a top 10 prospect within the Reds system with Trammell, Siani, Fairchild, and Friedl all ranked ahead of him in the OF. I hope he becomes an All Star, but all this talk of him emerging and being the CF for the Reds is premature. As I said let him repeat his Dayton numbers at AAA then we can nominate him for CF of the future. Only one place uses a letter grade, John Sickels. Baseball America, Baseball Prospectus, Fangraphs – they don’t use those kinds of grades. And yes, Jose Siri IS a top 10 Reds prospect. Baseball America has him at #9 in the Reds system. Baseball Prospectus has him 8th. Fangraphs has him 7th. He’s 7th on my list. So I have no idea where you are looking at, but the consensus is very much in disagreement with what you are saying. Unless the only place you are looking is at John Sickels list. As I said, you are underselling him. Guys we need to remember we just went through 5 years of Billy to see if he would ever hit.Key thing to me that makes all the difference is when Siri does hit it he hits it with power.His speed and defense are comparable right now and well I will just go ahead and say it if he can keep his obp at or above 300 then he should play. Doug if only one place uses letter grades, and that grade is a C how would I be underselling him? That would be exactly what I am stating. So I would say the consensus is very much in agreement with what I am saying. I am starting to see why you are so disliked and constantly criticized for being condescending. That list hasn’t been updated for the 2018 season. You stated that he wasn’t a Reds top 10 prospect. I showed you that he was in fact a Reds Top 10 prospect. I stated that you may be underselling him a little bit, noting that he’s risky, but why he could still be a quality big leaguer. Where is the condescension there? By showing that you were incorrect in your statement? My goodness. It isn’t condescending to express disagreement. Almost everybody here disagrees with somebody else from time to time and says so. That’s not condescending. Doug spends a lot of time studying minor league players–probably more than most or all of us–and can rightly speak with authority on the subject. Again, that isn’t being condescending. I understand Doug spends a lot of time studying minor league players. I’m sure the professional scouts and evaluators do as well. They all project Siri to be between average and a backup, with the caveat that he has the potential to be much more if he can work on his plate discipline. There have been numerous complaints about Doug and the way he treats commenters on this site. I understand that it is his site now and he is free to do what he wants and any of us are free to leave. All that I am saying is that “where there is smoke there is fire”. Maybe he comes across wrong over the internet or maybe he really does think he is smarter than everyone. I don’t know, but the site seems to have taken a turn for the worse. I’m really confused here. I simply pointed out that I thought you were selling a guy short, then corrected information that you stated as a fact (that Jose Siri was not a Reds Top 10 prospect). That somehow turned into I’m condescending, people don’t like me, I think I’m smarter than everyone, and the site has taken a turn for the worst. Would we all prefer that when someone states incorrect information (and not opinion, but actual facts), that it’s not corrected and just left to be unchecked? I’m just not sure what we’re doing here, Bill. You seemed to get your feathers incredibly ruffled by me pointing out that everyone except John Sickels had a much higher ranking and belief in Jose Siri as a prospect than your original post suggested that he was as a prospect. I wasn’t abrasive. I wasn’t insulting. I stated, “I think you are underselling him here” and explained why I felt that way. Your responses come off as if I were in fact insulting you while stating my disagreement. I don’t know, man. I just don’t get what’s going on here. And yes Doug that list has been updated to include the 2018 season, which is why India is listed on it. I am confident that the 2018 draft pick wasn’t added to the list prior to the 2018 season. Prospects from the draft were simply added in. The list hasn’t had a “full redo” to account for the 2018 season. Their lists will be coming out soon. The last time it was updated was at the midpoint of the 2018 season. It has not been updated to include the entirety of the 2018 season. Doug, What do you think of Tony Santillan’s windup ? To me it looks like it’s something our new pitching coach might make some significant improvements to. Is there a setting to turn off embedded video? The play/pause button no longer seems to work. Not a fan of autoplay. I’m not saying to rush this guy or not. However, when I read “there’s no need to rush him”, that made me think of the Reds “Taking their time with him, don’t worry about moving him to the big club until he’s 28, etc.” The thing is, by that time, the guy should have pretty much hit his prime with a major league team. I mean, I’m all for “taking their time”. But, we need to be getting these kids up here at some point in time. Prospects have two purposes, to eventually pitch at the major league level, or for tradebait. If we aren’t going to be seeing these young studs at the major league level until they are at minimum 25, I say we need to consider trading them. Just “consider” for the haters, not definitely trade them. Santillan isn’t even 22 yet. “Taking their time” means not bringing him up to the bigs with less than 20 starts above A ball. With Wood and Roark on 1 year deals, he’s a serious contender to be in the big league rotation next year. If he’s there opening day (possibly not likely for service time reasons, but could be shortly after that) then he won’t even be 23 yet and in the big leagues. Santillan has been a poster child so far for continuous improvement. He seems to improve 1 or 2 things each year since being drafted to the point where now he is resembling a well rounded pitcher with plus tools. Last year was his control coming around, and what I hope to see this year is his command within the zone improve along with the control. If that happens, I think the K numbers take a jump while maintaining the lower walk rate. It’s a fine line. We have 6 years of major league control and don’t want to waste 2 or 3 because a player’s not ready. I’m looking forward to this series of articles, especially with the new guys and minor leaguers. Age doesn’t matter nearly as much with pitchers as it does with hitters. Plenty of good pitchers (Jacob DeGrom being Exhibit A) don’t really get started as major leaguers until age 26. To me, then, the plan with Santillan should be to bring him up if and only if the team is very confident that he is ready to be effective against big-league hitters. The Reds have him for 6 (or 6.9) years, so their interest is in getting the most they can out of those years. It doesn’t really matter if his rookie season is age 23 or age 25, as long as they get 6 good years out of him. “Rushing” him would likely result in his being ineffective or the first couple of years, which would be a waste of an asset. Bring him up when he is ready, but not before. He might be ready next year, but it is not a big deal if he isn’t. They rushed Homer Bailey and he floundered for a couple of years. There is a good argument that they rushed Robert Stephenson through the system, even when control issues suggested caution. Just a little constructive feedback but I think that stat table would be more useful if you put the rate stats (K/9, BB/9, etc) instead of the raw totals. I didn’t know much about Santillan until recently, but I’m really excited about this guy. I’ve heard you and Chad talk about him and you guys have seem really high on him. I’d love to see him get a shot with the Reds this year. I am all for India, Barnhart and a lower prospect for Realmuto(regardless of renegotiating), but if Santillan is included as the potential “prospect”, then NO deal. Let the Phillies have him. The Braves are out of the Realmuto sweepstakes. And have been out. It seems to be down to the Phillies, Reds, and Padres. And to a lesser extent the Dodgers and Rays. Reds probably need to up their offer some. Marlins will have to make a decision soon. Yikes, no way would I do Sixto, Bohm, and Alfaro if i’m the Phillies. I wouldn’t move Sixto in any trade short of brining back an ace with multiple years of control. Reds do not need to up their offer if it is as reported, JTR is not extending with anyone. 2 years away from a payday the Reds cannot afford. Marlins have said that they want it done by the time they do their version of Reds fest which is this Saturday. TB, India and a Aquino level prospect is worth him. If the Fish don’t like that, let them deal him elsewhere. Just want it to be over, just slightly less then the Bryce and Manny show. Big pass if that is the cost. India, Barnhart, one of Aquino/Fairchild/Mella/Lopez. Final offer. Santillan has progressed well so far. Duke made a good observation about Santillan improving a couple of things each season. The IP’s look very much in line for a 2020 starting rotation spot. More than likely Tanner Roark’s spot. He threw 128.0 IP’s in 2017. He threw 149.0 IP’s in 2018. Tack on 20 more for this season and he would be at 169.0 IP’s. He is getting stretched out. That puts him in line for 180.0+ in 2020 in the Reds rotation. Hopefully, Santillan is at AAA when September rolls around. Louisville as usual is probably not making AAA playoffs and the AAA season usually ends about Sept. 5th. That could make him a good September call up. But that also will be dependent upon whether MLB changes the rules for September call ups and limits the roster to 28 like so some have reported. Here’s hoping for a very successful 2019 season for Santillan. Let’s all hope the Reds brass keep balking at any mention from other teams about Santillan in any trade talks. Santillan can help the Reds get that monkey off their back regarding their inability to develop home grown starters. Yankees rushed Jose Rijo in 1980s. Oakland took it slower. Reds benefitted in 1990s. 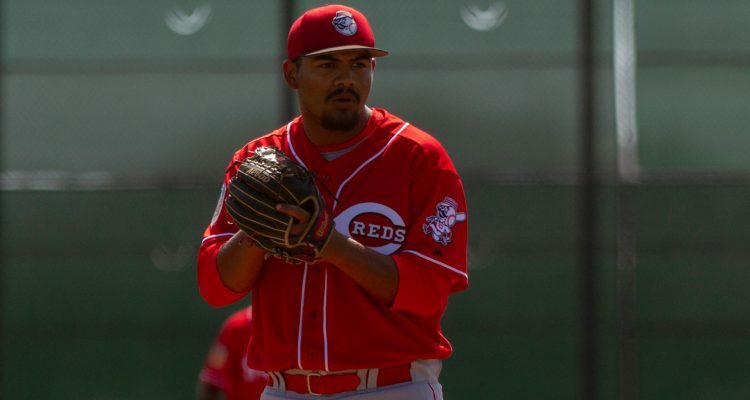 Santillan should be in Reds SP rotation by 2020 if he continues to progress. 2019: Learns to command the ball within the strike zone while maintaining control improvements and use of above average to plus pitches. On the Catcher front, former reds superstar, Devin Mesoroco, will resign with the Mets. Minors deal with a camp invite. I am shocked he couldn’t get a one-year deal with a major league team as a backup catcher. Devin’s limited runs of success came only when he played a lot and therefore got a lot of consistent at-bats. Anytime he has been used sparingly, he has not gotten his hitting going. Combine that with never having been a strong defensive catcher, and he projects to be a below-average defender whose bat never gets going. With teams heavily emphasizing the defensive side of the equation, especially for back-ups, and it adds up to a tough situation for Devin. I wonder if he has considered asking a team to keep him in the minors for a while so he gets his bat going again, then gets called up when he may get regular playing time. I don’t think anyone would ever propose the idea of playing in Triple-A instead of sitting the bench in the Major Leagues. He would make more money in a month, sitting on the MLB bench, than he’d get in the minors (even as a free agent) in an entire year in the minors. Question: Can’t a player (with Devin’s years of service) negotiate a contract that pays the same in both places? Can he? Well, he could try. But no team is paying him $800,000 to play in Triple-A. $100,000? Maybe. Phillies deal for Realmuto is complete. That is too bad, but a too high price to pay it would seem. 3 players and international bonus slot money. Phillies had to overpay to get him. 6 days till baseball. Well at least until P & C report. Glad that’s over now, let’s play ball. Worst news of the Winter. 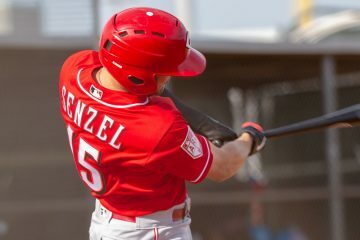 Senzel and Trammell better be the next coming of Ken Griffey Jr for the Reds or this was a lost opportunity. First Yelich…now this. I hope the so-called experts are right on Senzel….I’ll gladly eat the crow. I don’t think you’ll have anything to worry about with Senzel and Trammell. I think the bigger worry is how long Greene’s elbow hold up in 2019? I am disappointed also in the Realmuto outcome. But that was a high price to pay. Sixto Sanchez is a top-20 prospect in all of baseball, #13 in one ranking. The Catcher, Jorge Alfaro was a top-100 prospect in MLB for 3 straight years before he got called up in 2018. He is said to have a cannon for an arm. I don’t remember him if he played any against the Reds last season. Will Stewart is a LHP starter that is said to pound the strike zone with a 92-93 fastball and an already very good change up. Breaking balls not so good. He was in some Phillies top-15 rankings. Stewart probably equals out to maybe a Vlad Gutierrez, or maybe more of a James Marinan or a Scott Moss. Plus they got $250,000 in IFA bonus slot money. That was only 1 bonus slot increment. The Reds definitely could have offered up a better option with the #3 player and #4 slot money. But I don’t think the Reds could match the #1 player and #2 player without giving up Greene or Santillan. Miami wanted to get one high pitching prospect from this trade. They got one. Beyond Incorrect, the Marlins have corrected the bad Yelich trade by completely ripping off the Philiies for JTR. Gross overpay on the part of the philles. but in 3 years, Areita and JTR will be gone from philly, and Senzel and Trammell will be everyday starters in Cincinnati. Much prefer it that way. They certainly might be starting for the Reds the next 2 years, but will they be All star caliber that we KNOW JTR will be? At this point if one or both of them don’t turn into All stars, then the Reds blew a massive chance to make an impact in 2019, by not offering them up for Yelich, Kluber, or JTR. We already know that they took a called 3rd strike on Yelich, time will tell on the other 2. WV – Thanks for the research on the prospects the Phillies gave up. Cheers to the Marlins for getting what is best for their fan base. Cheers to the Reds FO for being disciplined. Oftentimes, the best deals you ever make are the ones that you don’t make. We don’t know the Reds didn’t offer Senzel for Kluber. There was some talk that either the Tribe or the Friars had some issue with something in Senzel’s medical report that may have nixed any potential deal. Are there any credible reports on Senzel injury reports dissuading other teams by established baseball writers? Rosenthal or gammons or even C Trent? The Realmuto non trade is evidence to the contrary. Quite certain if Senzel was in that package, JTR would be heading to Goodyear. The Padres and Indians were never trade partners. The Padres are the Reds- bad team with great high ceiling prospects trying to fast forward a rebuild… Neither team is trading major league ready or near ready future stars. They want to win very soon. The Indians are trying to extend their window and cut payroll to sign their core young stars in lindor and Ramirez. Kluber was simply a tantalizing wild card to get an overpay for 2 more major league ready Uber prospects. The weak AL central and competitive imbalance in the AL allows the Indians such freedom. They don’t need kluber to win the division. The reds trading partner would be teams who are trading stars now for prospects in 2021. The report from the Padres guy about Senzel is about all we got. He’s been a baseball reporter for a long time. There seem to be some hits-and-misses in his history, though. I’m glad the Reds passed. The Phils gave up their number one prospect, and that’s too much for two years of Realmuto. The Reds’ front office drew the line in the prospect-list sand at India, and held to that position. Good for them. Completely agree with this. We need to strike the right balance of winning baseball but not mortgaging the future. I want/need a few sustained years of consistent winning. Agree, glad the Reds didn’t match that offer. Pretty big overpay by the Phillies. I agree 100% and to the Marlins credit they got a big haul.Smart move by the Reds. That’s how I read it too. If the Reds needed an upgrade at C anyway and were close to a deep run in the playoffs, maybe I move H. Green or Santillan in the deal but the Reds aren’t quite there yet. I’ll post this without comment. The Commish says no to the DH in the NL, probably through the current CBA. That carries through to the end of the 2021 season. No DH for the next 3 seasons anyhow. Put that baby to bed for a couple of years. Yea. Three cheers. I’m not a fan of the DH either. I can see some of the reasons people want it but just not my style of ball. I like having more of a team’s bench involved in each game, even if it’s just one PA. I also don’t like the number of AL teams with 8 and even 9 guys in their bullpens.